Did Jesus really die spiritually? According to some He did and others He did not. But first we must define what people mean when they say “Jesus died spiritually.” Some people use that phrase to mean He went to Hell and was tortured by demons for three days. If that is what people mean when they teach Jesus died spiritually, then NO, Jesus did not die spiritually in that sense. There is not one shred of evidence from Scripture that Jesus being tortured in Hell ever happened. It is utter nonsense to teach that. 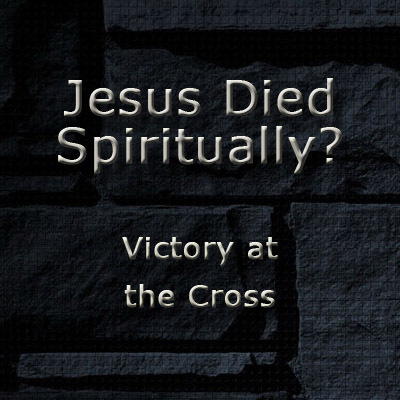 In fact, I can prove in this article that He won complete victory on the cross alone. However, I have found most people do not know what spiritual death is. Did Jesus experience a spiritual death? I believe He did, on the cross. Another area that people misunderstand concerning spiritual death is discerning spirit, soul, and body. As shown in my other articles, because man does not recognize that he is a spirit and soul and body (1 Thess 5:23), as was Jesus, he has had a hard time understanding certain statements and events in the Bible. This is another example where Bible teachers have not correctly recognized the spirit, soul, and body and thus they have incorrectly divided the Word. If you do not understand that Jesus had three parts, just like you and I, a spirit, a soul, and a body, you will have a hard time understanding exactly what took place on that cross. You will also have a hard time understanding what took place in the Garden of Eden when man sinned. Adam had a spirit, soul, and body. When he sinned, his body was sentenced to death and became mortal (death-doomed). However, his spirit also was sentenced to death. Jesus redeemed us from both physical and spiritual death and to do so He had to die both deaths and rise from both. Hallelujah! This doctrine does not lessen God but gives Him more glory and honor that is due His Holy Name! Physical death – the separation of the spirit of man from the body of man. Spiritual death – the separation of the spirit of man from God or God’s presence. To clarify, “died spiritually” means God the Father turned His face from Jesus when He took our sin on the cross. He withdrew His Holy presence from His Son for a moment. It does NOT mean that Jesus stopped being divine or that He was only a mere man at the time of His death. Jesus at no point stopped being God – that is impossible. He could not stop being who He is. “God” is not a title bestowed on someone; He is a person. We use the term trinity to explain that there is God the Father, God the Son, and God the Holy Ghost (they are three distinct persons but one God). It is impossible for any part of the Godhead to stop being who they are, namely God. Also, going to Hell does NOT mean dying spiritually. (When Jesus went to Hell He was alive spiritually which I shall prove later in this article). Hell is simply the holding place of the spiritually dead men until the Day of Judgment.